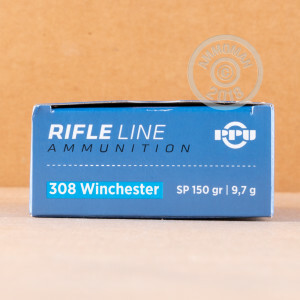 Suitable for use in bolt-action and battle rifles, these .308 Winchester rounds from renowned Serbian manufacturer Prvi Partizan feature a soft pointed tip for better expansion against midsized game such as deer or hogs. Available here in boxes of 20, these rounds fire a 150 grain projectile and use non-corrosive Boxer primers and reloadable brass cases. Prvi Partizan (PPU) manufactures over 400 different types of cartridges at its three factories in Uzice, Serbia. The company has been around in one form or another since the 1920s, when it was founded in a military barracks as the Arms and Ammunition Factory of Uzice. PPU ammunition is generally regarded as high-quality and has enjoyed great success in the US market due to its combination of low cost and high-quality components. 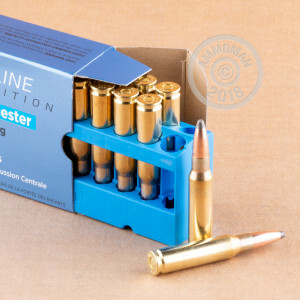 Buy a few boxes of this ammo to get your total over $99 and qualify for free shipping. AmmoMan.com charges you only the list price for what you buy.